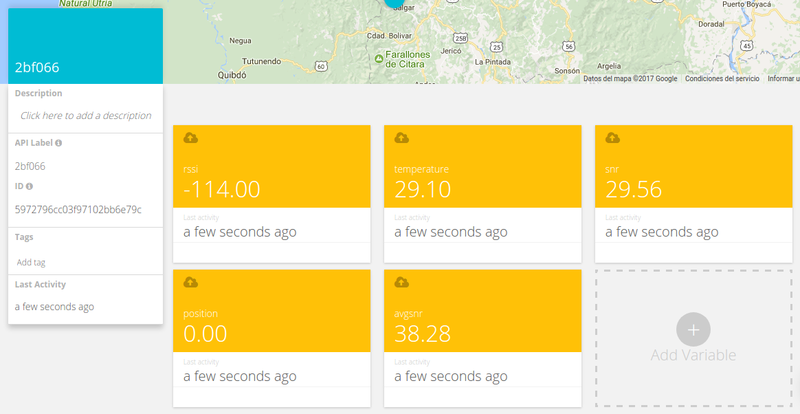 Learn how to build an IoT application over Sigfox integrated with Ubidots - send temp readings based on motion sensors. 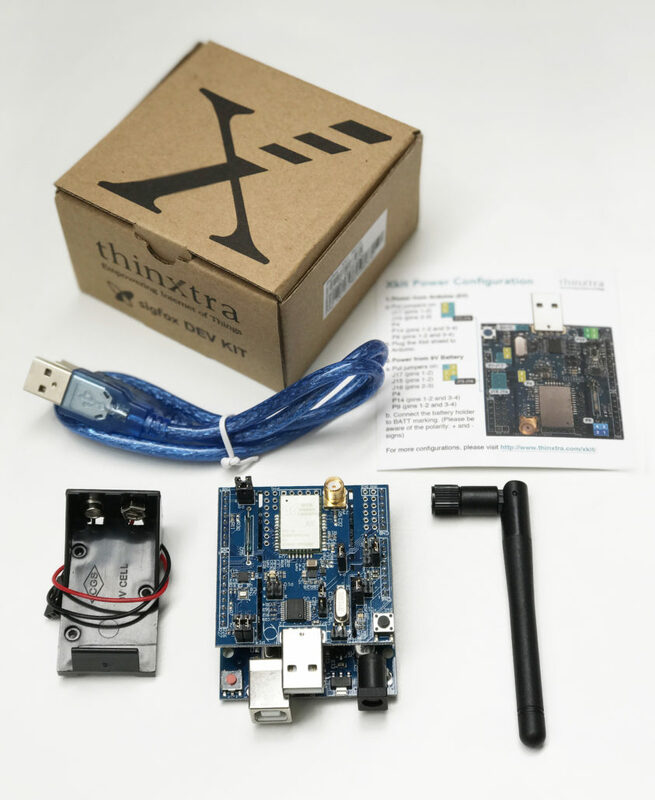 The Thinxtra devkit Xkit boasts a full suite of features and accessories to empower anyone to develop an IoT solution. Perfect for start-ups, DIY home IoT projects, and academic research, this kit has everything you need to hit the ground running using the Sigfox's global connection network. In this article, you will learn how to program an Thinxtra Xkit for an IoT application that takes and sends temperature readings via Sigfox, whenever motion is detected. 1.- Register your devkit on the Sigfox backend portal; reference to the video below to learn more and register your Thinxtra Xkit Device on Sigfox backend. 2.- Download the Thinxtra repository to receive the required libraries. The libraries should be copied to the location with Arduino libraries. Created by Gildas Seimbille, Thinxtra Solution Pty. NOTE: remove the Thinxtra shield to be able to compile the code properly. 3b.- Connect the board to the computer, then select the Arduino UNO as board from Tools > Boards, also select the Port COM of the board from Tools > Port. 3c.- Verify your code in the Arduino IDE by choosing the "Check Mark" icon in the top left of the IDE. Once the code is verified, you will receive a "Done compiling" message in the Arduino IDE. 3d.- Upload the code into the Arduino UNO by choose the "right-arrow" icon beside the check mark icon. Once uploaded, you will receive a "Done uploading" message in the Arduino IDE. 4.- Connect the Thinxtra shield with the Arduino UNO once your device is compiled and reset the board by pressing the red button on the Arduino UNO. 5.- The code above sends temperature value to Sigfox every time the board detects a movement. To visualize the the data sent, open the serial monitor of the Arduino IDE. You can also verify the messages via Sigfox's backend by selecting the ID of the Thinxtra device from the device list. 6.- With the above quick steps, your device is now integrated with Ubidots and sending data whenever the the Thinxtra Xkit senses movement. 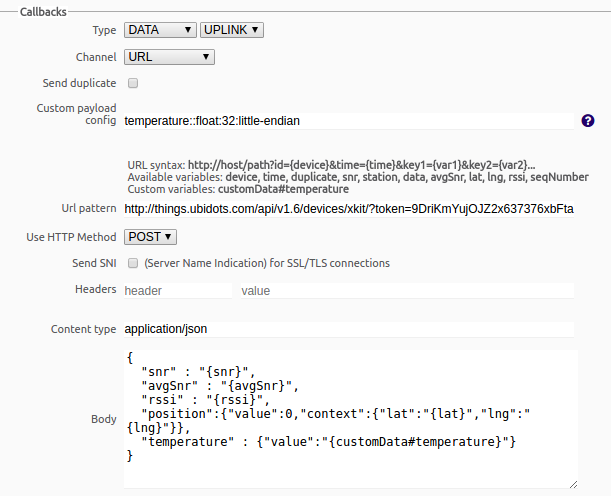 To visualize your data, sign into your Ubidots account and verify the device just created with the Device ID and see and manipulate the collected data as needed. In this tutorial we describe taking temperature readings based on movement. When other parameters are assigned into the callback body like the rssi, snr, avgSnr, and position, these too will be recorded or assigned when built by the developer. IMPORTANT NOTE: If you desire to returns device messages where at least one callback has failed, reference to the Sigfox API to know how to implement it. Now it is time to create a dashboard to control and manage the variables of your Sigfox device. To learn more about Ubidots widgets and events, check out these video tutorials.